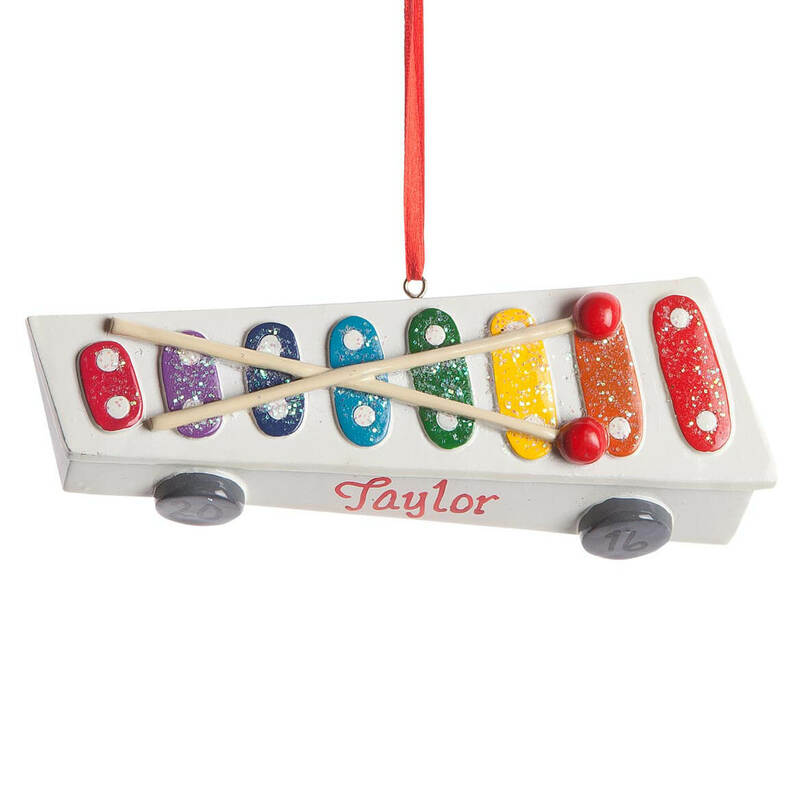 Celebrating childhood joy and the magic of music, our personalized xylophone ornament will be specially made for one unique recipient … whether noise-making toddler or accomplished adult. Finished with sparkling glitter and red hanging ribbon, the artful personalized ornament is only found here … yours alone when customized with name and year! Specify name; limit 1 line, 12 letters/spaces. Specify year; limit 4 characters. Resin. Christmas ornament measures 5″ long x 2″ high. Posed in a perfect Warrior 1, this yoga fan is extra fun when personalized for you or a friend! Wonderfully detailed in shiny resin, our personalized yoga ornament is a thoughtful gift for a special teacher, new student or dedicated “yogi” on your holiday gift list. We’ll add any name to the blue yoga mat, creating a custom keepsake. Specify name; limit 1 line, 10 letters/spaces. Christmas ornament measures 4 1/4″ wide x 3 1/2″ high. 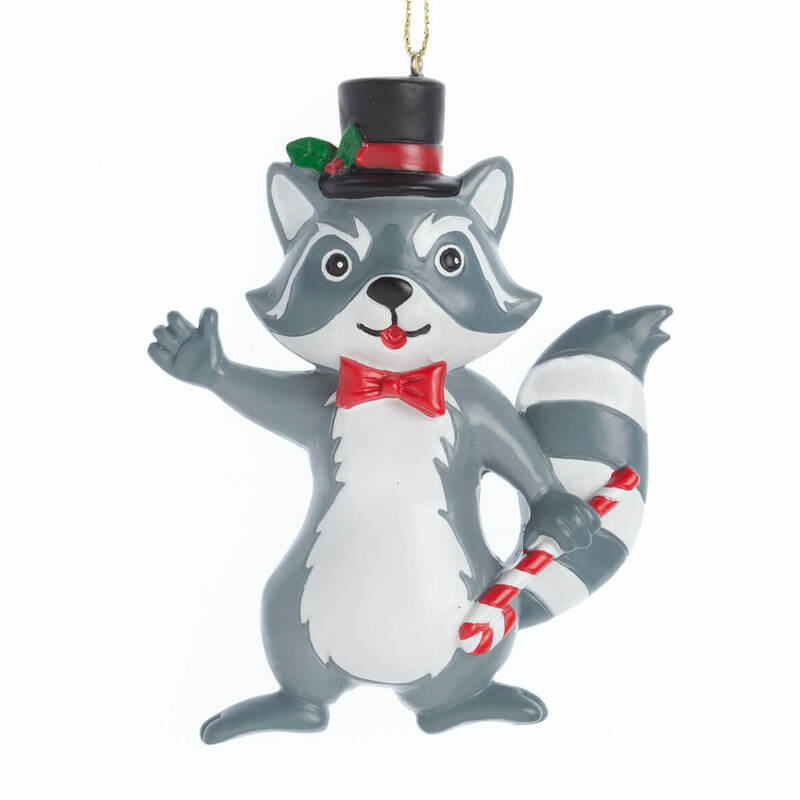 Donning a fancy top hat and festive bow tie, this dapper Woodland Raccoon ornament is a holiday darling—stealing your heart for many years to come! A fun gift for animal lovers and kids of all ages, our exclusive 3D Christmas ornament boasts exceptional detail all around. Resin. Ornament measures 3″ wide x 4″ high. Celebrating the hardworking driver in classic style, this truck’s cab reads “Safety 1st!”, and its trailer is engraved with: “Carrying loads, large & small, always in for the long haul!”. 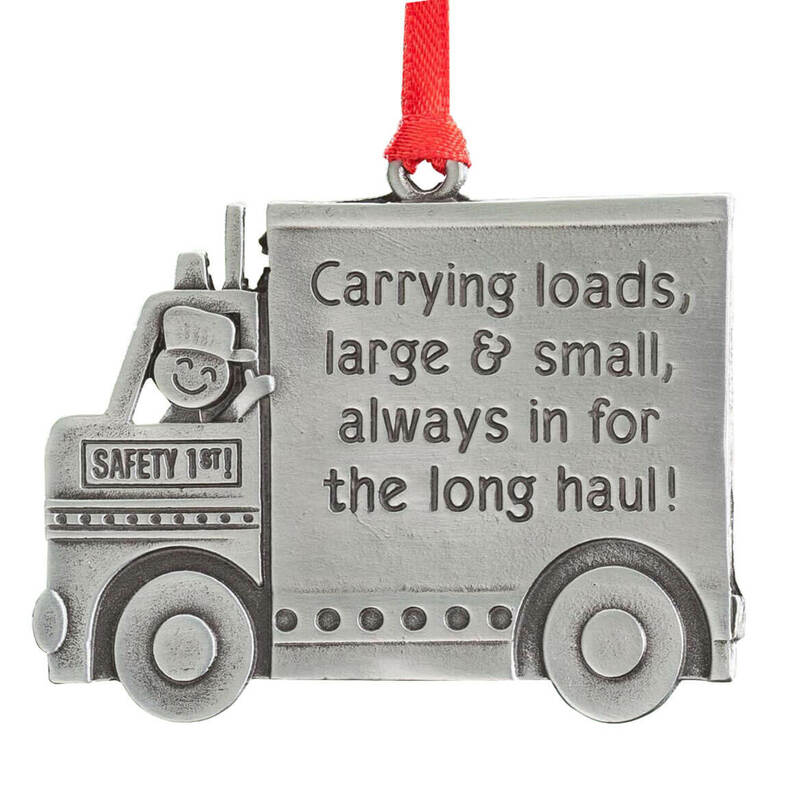 Logging in miles of smiles for many holidays to come, the highly detailed ornament is a fun gift or stocking stuffer for any trucker on your list. Pewter-finish metal. 2″ long x 2 1/2″ high. 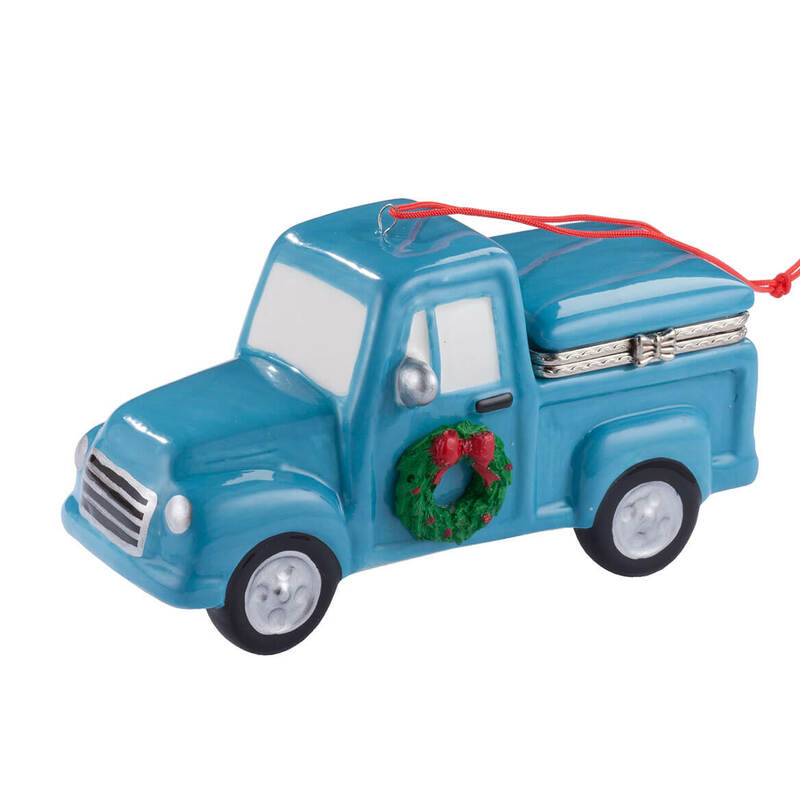 Delivering a surprise you tuck inside, this truck with wreath trinket box ornament turns the tiniest gift into a cherished Christmas memory. Stash candy, jewelry, coins or truck keys in its clasped “cargo” box, then hang it on the tree or display it on any flat surface for the lucky recipient to find. Brilliantly detailed all around, the 3D Christmas ornament shines in 100% dolomite with fancy silver-tone finish on metal hinge and clasp. For versatile use, year after year, it includes a looped string and flat base for hanging or tabletop display. 4 1/2″ long x 2″ wide x 2″ high. 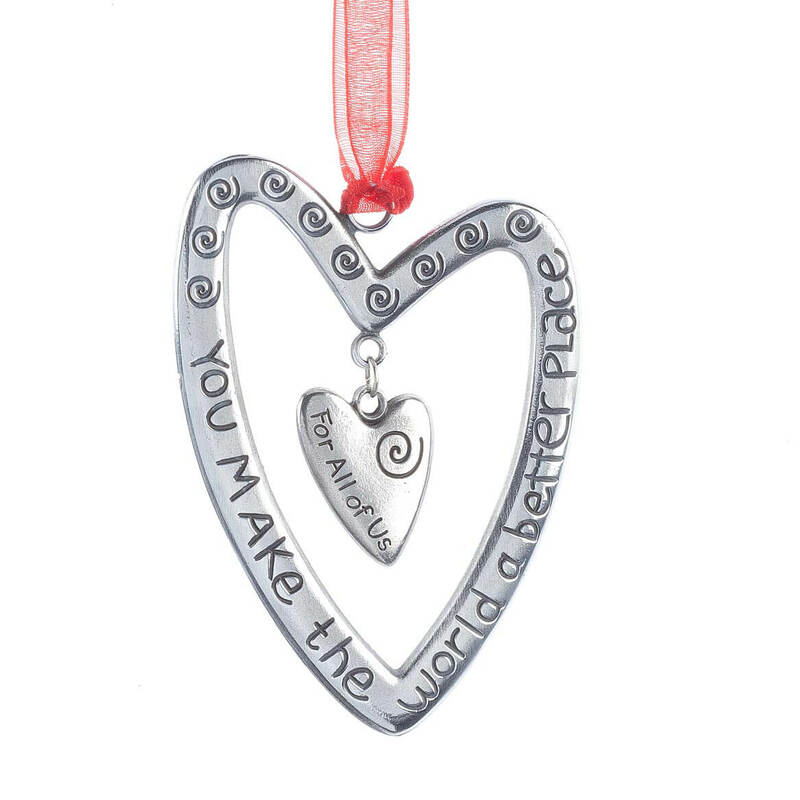 Remind someone they make your world a better place with this gleaming pewter ornament they’ll cherish forever. Each shiny heart has another heart inside, engraved with “Mom”, “Nana”, “Daughter”, “Sister”, “Friend” or “For All of Us”. A beautiful gift of style and sentiment, each features a red ribbon for hanging. Specify style code. Pewter-finish metal. 3 1/2″ long x 2 1/4″ high. 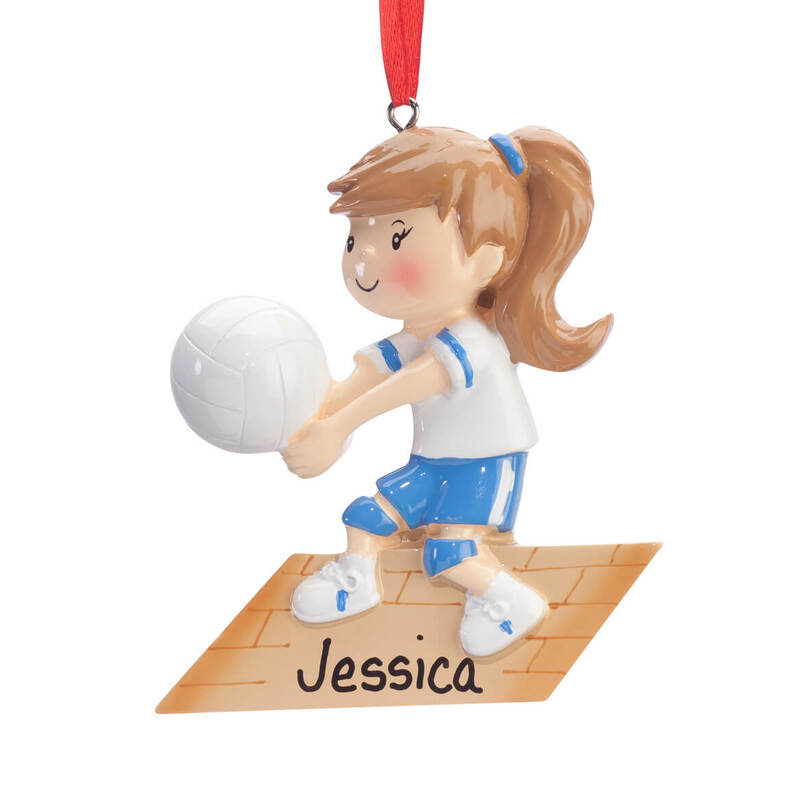 Serving a custom “shout out” to one star athlete, this personalized Volleyball ornament scores extra points when given to your favorite player! Fun for servers, spikers, passers, players and fans, our volleyball ornament is adorably detailed, and sure to be loved for many holidays to come. We’ll add one special name at no extra charge—netting you a thoughtful keepsake gift. Specify name; limit 1 line, 10 letters/spaces. Resin. Christmas ornament measures 3 1/4″ long x 3″ wide. 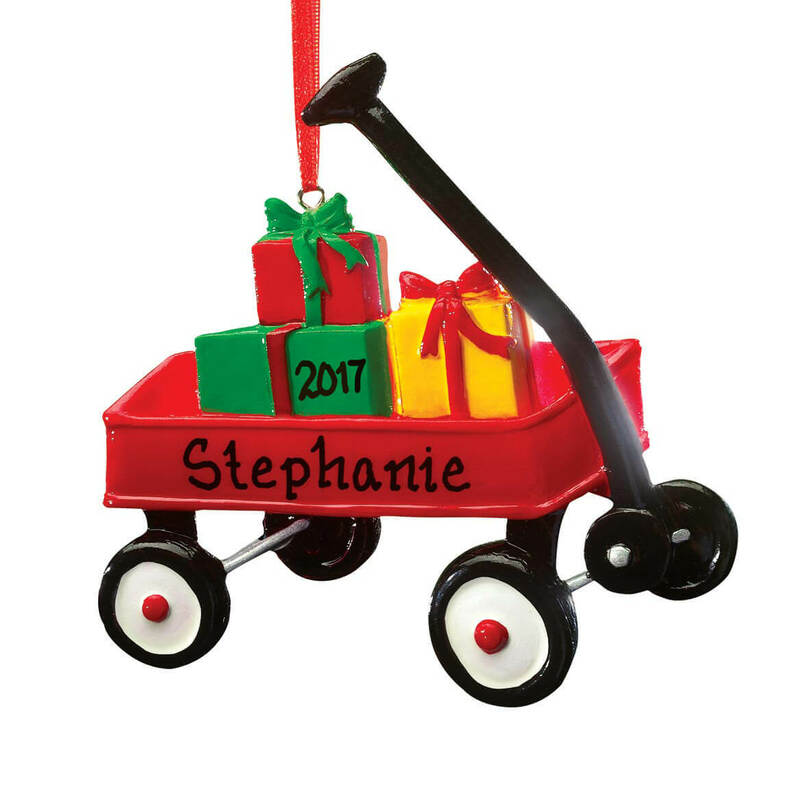 The little red wagon you loved as a child now comes ready to hang on the Christmas tree—personalized for a cherished gift. Beautifully handpainted and detailed all around, our 3-D personalized wagon with gifts ornament is loaded with festive wrapped gifts and holiday cheer. We’ll add a special name or message, delivering a custom gift for kids of all ages. Specify name/message; limit 1 lines, 10 letters/spaces. Specify year; limit 4 characters. Resin. Personalized Christmas ornament measures 4″ long x 4″ wide. All aboard for holiday fun! The train on this colorful personalized train ornament is decked for Christmas in bright red and green with a festive wreath. Resin, with hanging ribbon. Train Christmas ornament measures 4″ wide x 3 3/4″ high. Specify a name; limit 1 line, 12 letters/spaces. Specify a year; limit 4 characters. 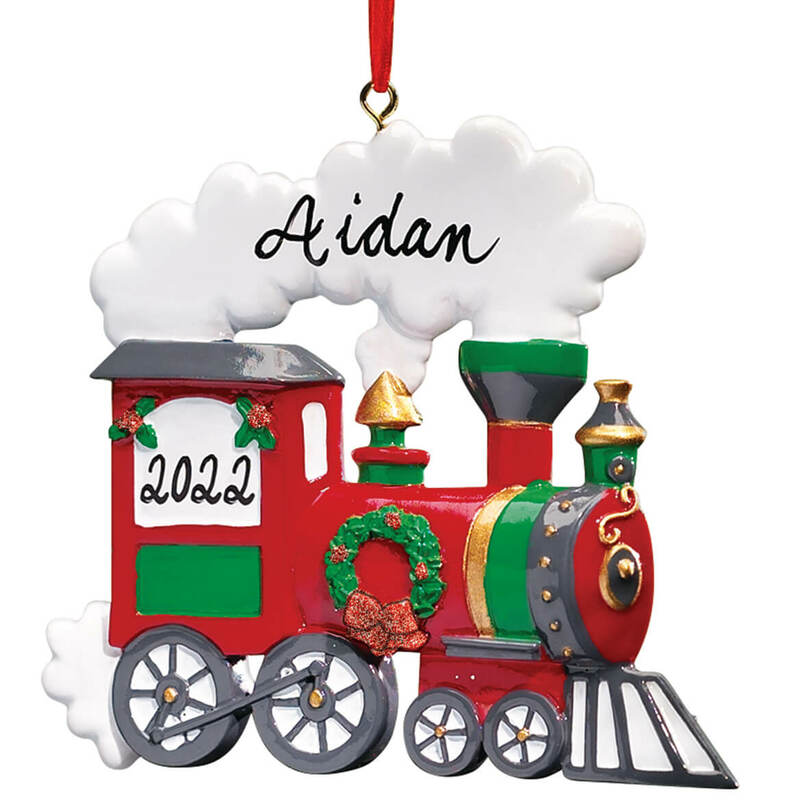 We’ll personalize your train ornament with your little engineer’s name and a merry year to remember! 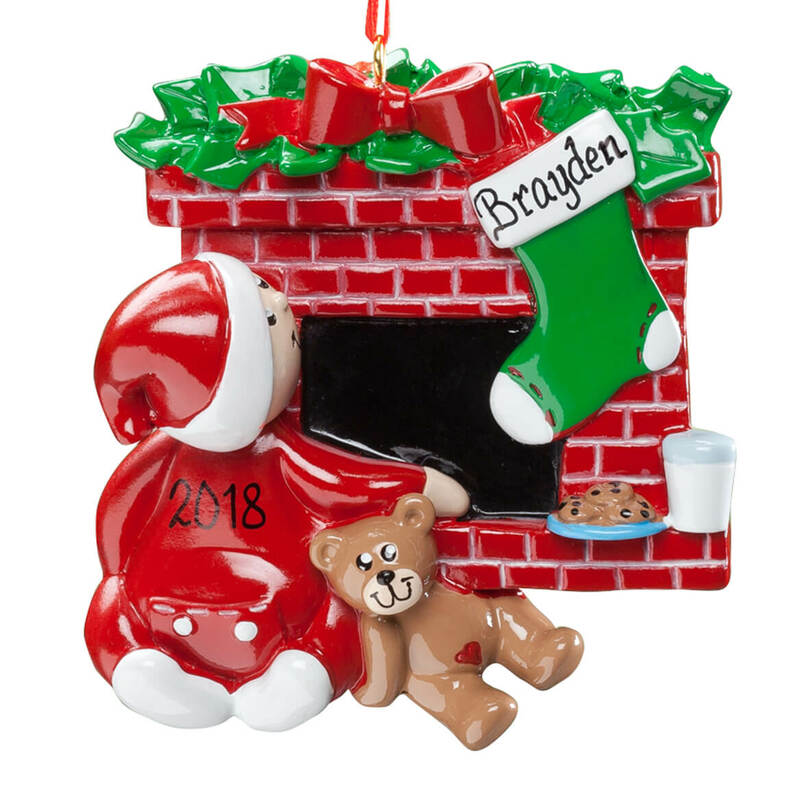 Celebrating the wonder and magic of waiting for Santa, this personalized Waiting for Santa ornament arrives for one special little believer! We’ll add any name and year to this bright 3D treasure, helping capture the joy forever. Specify name; limit 1 line, 8 letters/spaces. Specify year; limit 4 characters. Resin. Christmas ornament measures 3 1/2″ long x 4 3/4″ wide.